We actually forgot that this model still exists. We know that Audi is currently working on the next generation A8 which will be packed with self-driving tech that should . 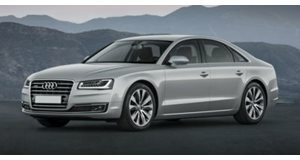 Until this new A8 is released, consumers can still go out and buy the D4 generation A8, which is still an excellent car. The A8 comes with either a 3.0-liter supercharged V6 with 333 hp, or a 4.0-liter twin turbo V8 with 450 hp. If you want something a bit sportier, you can get the S8 which comes with the same 4.0-liter V8 but tuned to a massive 605 hp. The S8 is an absolute beast which can go toe to toe with rivals from AMG. With 605 hp, the S8 sits right between the 577 hp S63 and the 621 hp S65, which is . We absolutely love the S8 , and definitely think that is deserves to be the top-dog of the A8 range with a $114,900 price tag. However, the S8 is not the most expensive A8 that you can buy. That honor belongs to the A8 L W12 at $137,900. Not only did we forget that Audi still offered a W12 A8, we certainly didn't realize that it was still the most expensive model in the entire lineup that doesn't start with the letter R. So why does the W12 deserve to be over $20,000 more expensive than the amazing S8 ? Well, right off the bat you may expect that the W12 would be the most powerful engine in an A8. However, the regular S8 and S8 both have more power. The W12 engine in the A8 produces 500 horsepower, which is 20 less than the regular S8. The W12 A8 is supposed to be a limousine (of sorts), so what about smooth torque? Well, even in that category, the W12's 463 lb-ft is less than the S8's 516 lb-ft. We really struggled to figure out why Audi was still offering this engine. In the Bentley Continental, the W12 puts out a minimum of 582 horsepower. For some reason, the W12 that Audi uses is 6.3 liters and less powerful, while Bentley only uses a 6.0-liter engine. We get that some people may love the exclusivity of such a limited production car, but we doubt that too many people still buy this car. We did a simple search to see how many Audi dealerships are selling a W12 in the US, and we only found two (one of which was a leftover 2015 model). Clearly then, this car is an afterthought for Audi. If you were smart, you would save more than $40,000 and get the A8 L with the 4.0-liter V8. So what do you miss out on for your $40,000? The W12 A8 does have a luxurious split rear seat with folding tables, and infotainment screens, but you can opt to have a normal back seat for no cost which would completely divert the point of ordering the W12. We suppose that if you plan to be chauffeured around in the A8, you may consider that W12. However, the A8 can be ordered in long wheelbase form with the V6 and V8, and those aren't exactly scarcely equipped. The A8 W12 is doubtless an amazing vehicle, but we can see why Audi is only offering such a small number of them.